The NCAA TOURNAMENT had a good start. 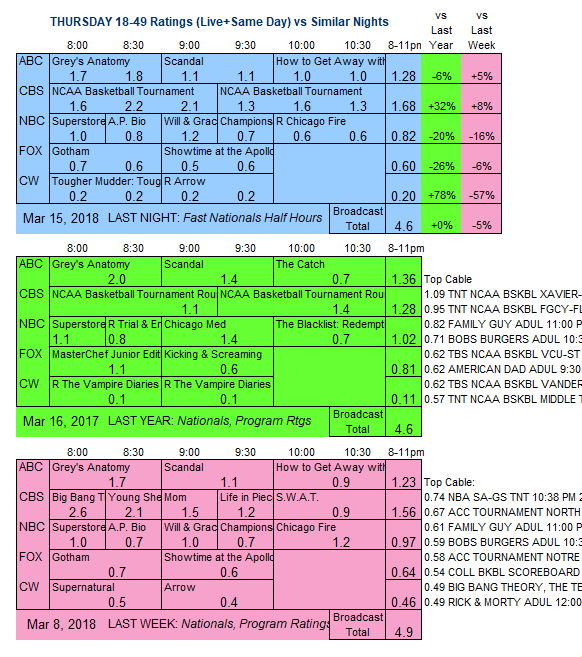 CBS: Thanks mostly to the early primetime game, the preliminary ratings for Night 1 of the broadcast NCAA TOURNAMENT was well above last year, at 2.0/1.4, compared to last year’s 1.2/1.3. ABC: After GREY’S ANATOMY rose 0.1 to 1.8 and SCANDAL held at 1.1, the season finale of HOW TO GET AWAY WITH MURDER was at 1,0, up 0.1 from last week but down 0.4 from 2017. 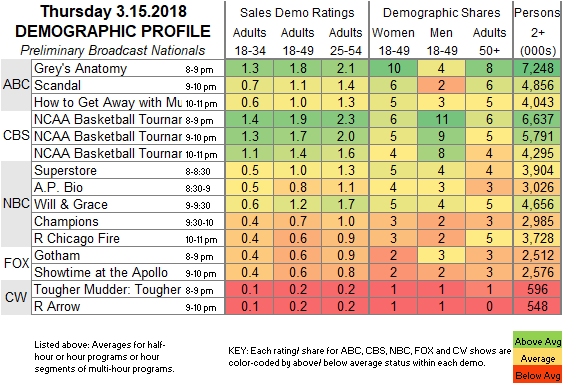 NBC: SUPERSTORE was steady at 1.0, AP BIO gained 0.1 to 0.8, WILL & GRACE rose 0.2 to 1.2, and CHAMPIONS held at 0.7. The night ended with a CHICAGO FIRE rerun at 0.6. FOX: GOTHAM fell 0.1 to 0.6, and SHOWTIME AT THE APOLLO remained at 0.6. CW: A TOUGHER MUDDER special and an ARROW rerun were both at 0.2. The NCAA TOURNAMENT continues to own CBS’s line-up tonight.